After a few years of simultaneously running a number of choirs and teaching an awful lot of individuals to play a number of instruments, an idea came to me: ‘These musicians have no-one to play with!’ The singers get together each week, meet lots of new friends and hone their skills in a context that makes sense.. ie as part of a group. The musicians are all ploughing a solitary path with only me, play alongs, or youtube for company. ‘What we need is a choir that’s a band!’ I thought, in a Eureka type moment. It took over a year to find the right moment, the right space and enough energy to start another new project – properly. But finally it was born. Band Eazy is here. 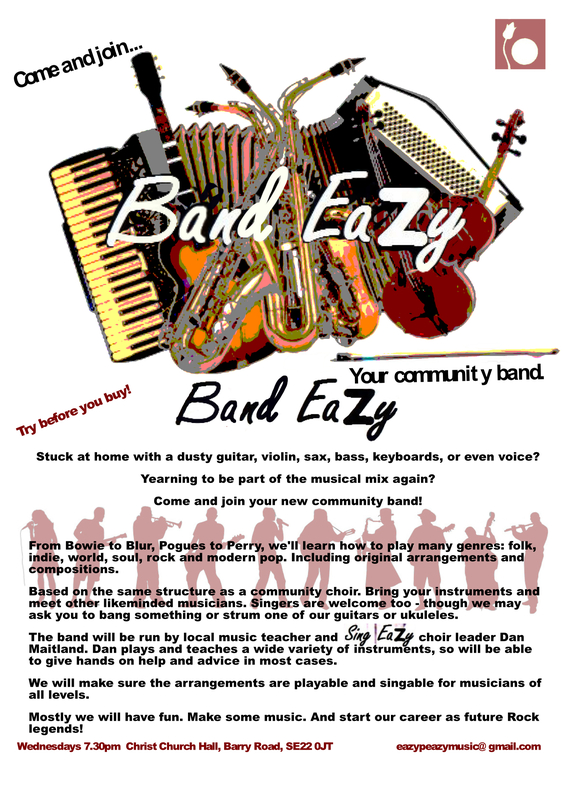 It has been running for 2 months now, and is lots of fun, with members from 18 to 80 – lots of guitars, ukes, basses, saxes and singing and banging things…But any instrument is welcome.. We would love some strings for instance. So far our menu has included the blues, gospel, the Pogues, Mr Springsteen, 90s soul.. Who knows where next we wander.. I can see students already improving at a faster rate than before, being much more motivated to practive and having fun with their instrument and meeting new friends. It works! We meet on Wednesdays at Christ Church hall on Barry Rd, East Dulwich. At 7 30. And have 3 guitars, 3 ukes, two pianos, lots of bangy things and a bass that you are welcome to borrow. 9 pounds per session. Or 40 pounds for 5.